Be persistent, be responsible, and make the choice to succeed. Rodolfo Costa shares advice from his parents, lessons learned from mistakes he made, pointers on how to be happy, and wisdom he picked up along the way in his new inspirational book. Take charge of your life. Don't wait any longer. Set your mind to start now. Forget about the past—it is gone. Don't worry about the future—it is not here yet. Create the desire to change your current situation and circumstances. 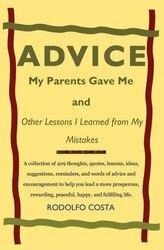 After years of procrastination and making mistakes that would become material for his manuscript, Rodolfo Costa compiled the ultimate inspirational collection in “Advice My Parents Gave Me and Other Lessons I Learned From My Mistakes” (ISBN 9781449025526, AuthorHouse, 2009). Rodolfo Costa’s new book is described on its front cover as “A collection of 409 thoughts, quotes, lessons, ideas, suggestions, reminders, and words of advice and encouragement to help you lead a more prosperous, rewarding, peaceful, happy, and fulfilling life.” With so much inspiration and so many words of wisdom, every reader will find what he or she needs inside. These practical tidbits of advice and encouragement, if read one at a time, will keep a person busy for well over a year pursuing the path to happiness. Beyond just inspiration, Costa challenges the reader by asking why so many have dreams but few ever accomplish them. People say they want certain things, but not knowing how to obtain them, they make little effort to pursue their goals. In truth, everything the heart desires is achievable if people just practice persistence, personal responsibility, and making the necessary choices to let happiness into their lives. By overcoming fear and shaking off limiting viewpoints, anyone can succeed, and Costa is ready to walk readers through the changes that lead to success. Excuses. Excuses…Excuses are the bottom line for why people fail to fulfill their dreams. Costa finds excuses unacceptable because he personally knows how they can hold a person back. For years he wanted to write a book, but he always found some excuse not to get started until he set a deadline—his fiftieth birthday. Once he took up his own challenge, writing made him discover how wonderful his life has always been. Now readers can equally discover the happiness and joy that await them. This book is like having Mom, Dad, a best friend, and a personal guru all in the same room providing invaluable wisdom and practical advice. Rodolfo Costa was born in Lima, Peru. At age nineteen, he said goodbye to his parents and immigrated to the United States. He had no idea what the future would bring—his only assets were three hundred dollars and a dream. Through the difficulties and joys of life, he has learned to be grateful for everything he has, and with gratitude he now shares his learned wisdom in his new inspirational collection. Today, Costa lives in Northern California with his son. “Advice My Parents Gave Me and Other Lessons I Learned From My Mistakes” (ISBN 9781449025526, AuthorHouse, 2009) can be purchased through local and online bookstores. For more information, visit http://www.advicemyparentsgaveme.com. For interviews and/or review copies please contact Rodolfo Costa at rodolco(at)aol(dot)com.